Today I have a super special treat for you; a Q&A with the wonderful and amazing Heli of HeliS! If you are not familiar with her work, I'm sure after this you will be as enchanted as I am. Hi my name is Heli. I live in Istanbul, Turkey with my turkish husband. Originally I am from Finland. Your handpainted animal brooches and wall hangings really took Etsy by storm! Your new watchdog brooches seem poised to do the same. Where did you get the inspiration for these? Are you an animal lover? Yes, I love animals! When I was child we always had a cat or dog. I would love to have a dog now but at the moment it is not possible, unfortunately. 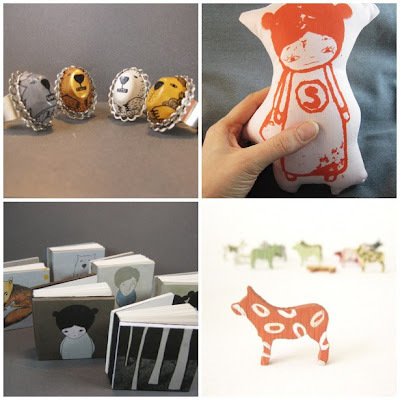 My friendly wild animals in my etsy shop were born ‘by accident’ last year. I casted plaster and had a little shapes but didn’t know what to do with them until in the beginning of the year when the first Polar bear showed his face. You obviously have a love for the miniature. Have you always? I don’t love miniature speacially, I am not a collector nor have obsession to tiny things. Actually I have been wondering why I make these tiny things? Maybe one reason for that is that they are easy to ship and it is fun to make them. I recently read about you in the Storque article about European expats. How does living in Instanbul influence your work? How did you adjust to your new home? By the way, I think your story is so romantic! Thanks! I don’t know how much Istanbul or Turkey has influence to my work, maybe not very much. I think I have more influence from Finland especially for my little book covers. Can you tell us some of your favorite spots in Instanbul? The islands in front of Istanbul are must in summer. So peaceful and natural places without cars with a touch of old days. As a Finnish who have used to live in quite small cities noisy and crowdy Istanbul is sometimes a pain and the most favorite places are the places with nature and silence and no other people around. To what do you attribute your sucess on Etsy? Originality, good pictures and regular listing and relisting. Making treasuries and being on treasuries is the most efficient thing to draw people in your shop if you are lucky enough to hit the front page in etsy I think. I am a member of European street team EST and we help eachother to promote our shops by making treasuries and it is always a big happy happening in our EST thread when a EST treasury hits the etsy frontpage. Anything else we should know about you or your shop?